Because in between all that Thanksgiving food…we need a little GREEN. 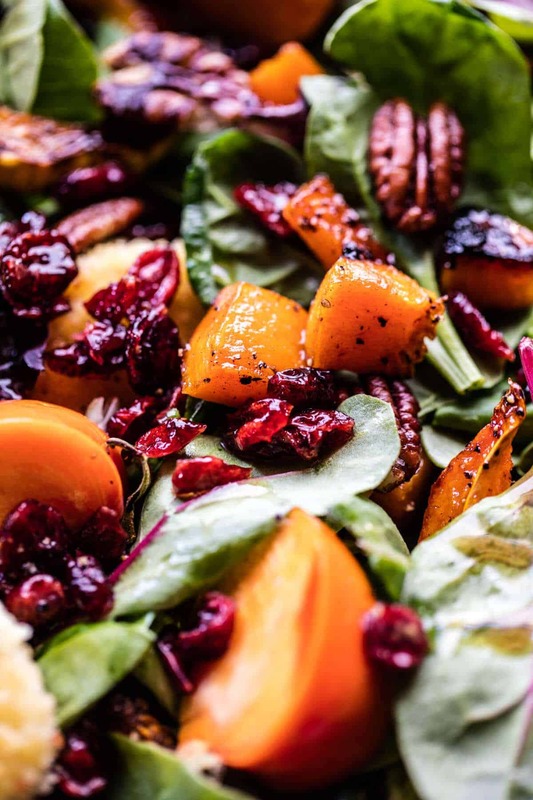 Or do we… of course we do, especially if it’s this cranberry roasted butternut persimmon salad. It’s so delicious you almost forget you’re eating salad, there’s just so much more going on in this bowl than just greens! Plus, I mean, there’s fried goat cheese here too. Yes, FRIED goat cheese! I think it’s safe to say that as far as holiday salads go, this is the one! It will even have you going back for seconds! <–obviously. 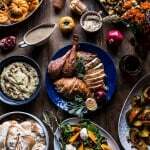 I know when it comes to Thanksgiving, that most of us really just want all the turkey, gravy, mashed potatoes, sweet potatoes, stuffing, and rolls. But I dunno, personally, I love some greens on my plate too. For one, I just like food with color in general, but I find a good salad really balances out the other foods piled on my plate. Anyone with me here or what? I know my brothers would totally disagree (except for you Brendan). They’re all about piling your plate high with beige, and want absolutely nothing to do with any color. Meaning no sweet potatoes either. They are freaks though, so I don’t normally take their advice when it comes to the Thanksgiving menu. Can you guys believe that Thanksgiving is just ONE week away? Oh my gosh! Even though I’ve posted mashed potatoes, sweet potatoes, mac and cheese, cookies, and even pie, I have yet to even start thinking about my T-day menu. I mean, yes those items that I’ve posted are surely being made, but it is Thanksgiving, and you guys know my motto – go big or go home! Do you guys have your menus set? I’m hoping you have some wiggle room left. I have a few more recipes that you really need to consider before next Thursday arrives…stay tuned! Are any of you hosting Thanksgiving, or maybe going to a friend or family member’s house? How about a Friendsgiving? My whole family will be here next week, minus my brother Brendan and his girlfriend Lyndsie, who will be at Lyndsie’s family’s house (you will be missed!) but they’ll be here for half of December and through Christmas. While we are losing two, we are gaining my cousin Maggie and her boyfriend Tom, along with possibly an old friend of my family’s. When it comes to the holidays at the Gerard house you truly just never know who’s going to show up…normally, there’s more people than you originally expect. Let the holiday craziness begin, right? Sooo anyway, I think I was trying to get to the point across, that I love a good salad on my plate, and this year, this is my salad of choice!! It is SOO good. I served leftovers to my dad, who’s not typically the biggest fan of winter squash, but even he loved this salad. He said it was the combo of warm squash to cold greens, mixed with the tangy dressing and topped with fried cheese. Just delightful – his words, not mine. And while I’m calling the cheese fried, what I really mean is pan-fried. Sorry, I didn’t go as far as deep-frying the goat cheese because that just sounded like too much work for a Thanksgiving salad. Pan fried is just as good anyway. To save time, simply fry the cheese in advance, then warm in the oven the next day along with the roasted butternut squash (I threw in some delicata squash rounds too!). Works awesome! The dressing is pretty simple, apple cider, vinegar, mustard, olive oil, salt and pepper…simple, but perfection…at least in my eyes! 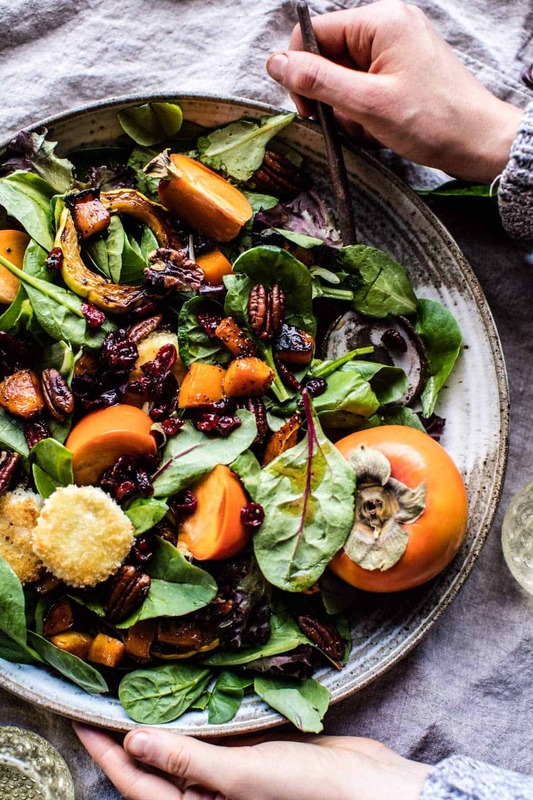 You can serve this salad cold or at room temperature, but my personal favorite it to keep the greens and persimmons cold and have everything else warm. It’s oddly the perfect balance. Question: since we’re having salad with dinner, this means our plates will be be totally well-rounded, right? Meaning that a second…ok maybe even a third piece of pie is totally acceptable, right? 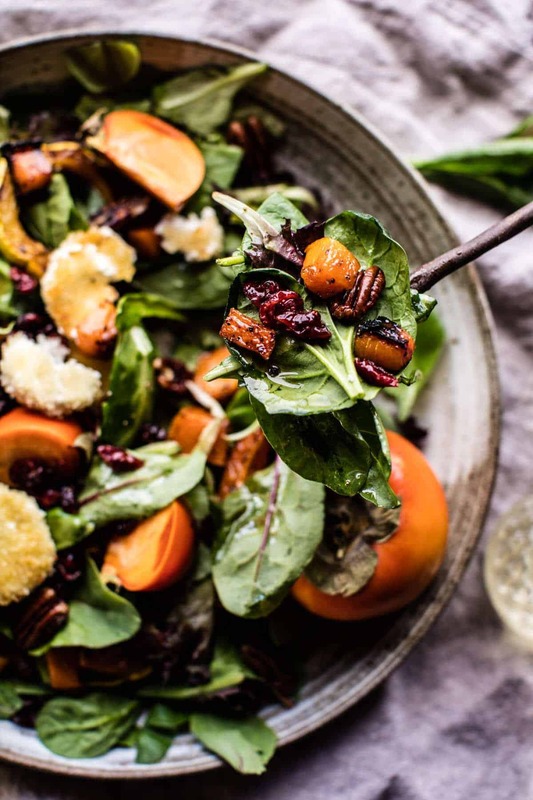 Cranberry Roasted Butternut Persimmon Salad with Fried Goat Cheese. 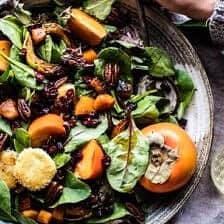 You can serve this salad cold or at room temperature, but my personal favorite it to keep the greens and persimmons cold and have everything else warm. It's oddly the perfect balance. 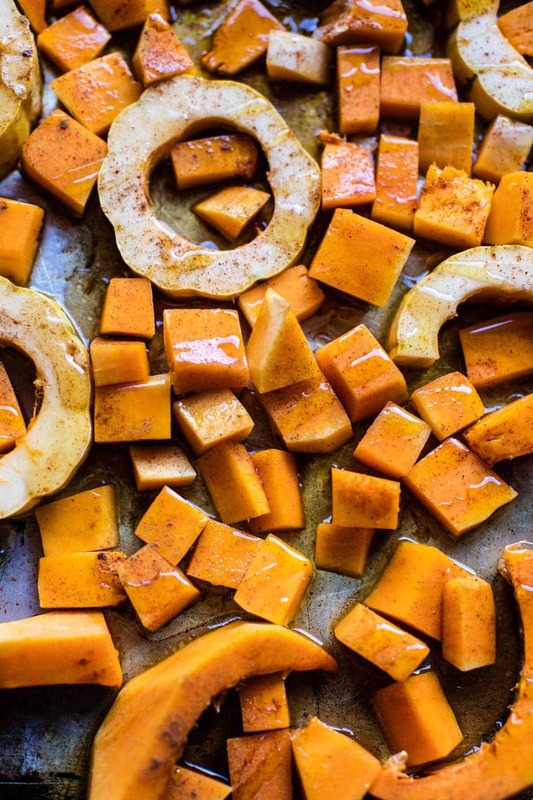 Spread the butternut squash out in a single layer on a baking sheet. Drizzle 2 tablespoons olive oil, maple syrup, cinnamon, ginger, cayenne, salt and pepper, toss well to coat. Roast in the oven until the butternut squash is tender, 20 to 25 minutes, stirring halfway through cooking. Remove from oven and stir in cranberries. Meanwhile, heat the apple cider and the cider vinegar in a small saucepan over high heat and boil until it has reduced to 1/4 cup, about 6-8 minutes. Remove from the heat and whisk in the remaining 1/2 cup olive oil and the mustard. Season with salt and pepper. To make the Fried Goat Cheese. Heat 2 tablespoons olive oil in a skillet over medium heat. Add the panko to one small bowl, then add the buttermilk to another small bowl. Carefully dip the rounds of goat cheese, first through the buttermilk, and then dredge through the panko. Carefully add to the hot skillet and cook for 2-3 minutes per side or until golden. To make these in advance, fry as directed and then warm in a 300 degree oven for 5 minutes. 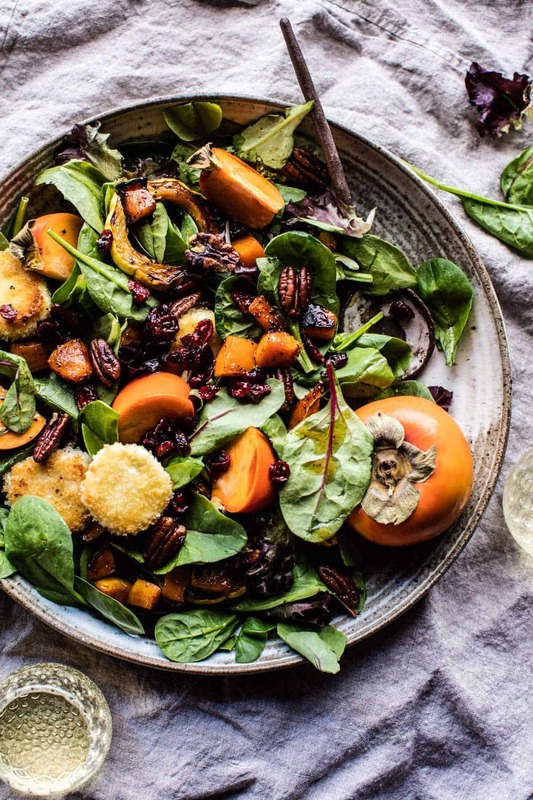 In a large salad bowl, toss together the lettuce, roasted squash, persimmons, and pecans. Add the dressing and toss once more. Top with the fried goat cheese. Enjoy warm or at room temperature. If you are short on time, skip frying the cheese and just crumble the goat cheese over the salad. Gosh, I just love Thanksgiving…and the way my brain can rationalize things. This looks so wonderful! All the best fall things on one plate 🙂 I will surely be making it soon, though our persimmon harvest was very small this year. 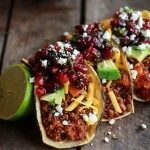 I also wanted to let you know that I’ve been making so many recipes from your site lately. 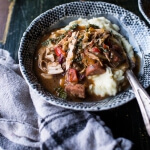 This week I wrote a post in my ‘A week of eating from the garden’ series and several of the dishes I made were recipes from your site: hhttp://www.growntocook.com/?p=5930 Thanks for the inspiration, I cannot fathom how you manage to come up with so many great recipes all the time! Stellar dish! And I love your photos here, so gorgeous! Oh yes! This salad simply has to happen before the season is over. You’re so great at combining flavors, Girl! Thanks so much Tori! I hope you love it! Looks delicious and the fried goat cheese , I love it! Yes definitely give it a try!! I hope you love this salad Carlos, thanks! this has hints of the upcoming Thanksgiving dinner! I’m excited! I’ve just had my first persimmon and I’m sort of obsessed! I hope you love this one Jessica! Thank you!! Making this for the Bishop boys coming home next week! Wonderful Happy Thanksgiving wishes to the Gerards, miss you guys!!! Hey Patti! You are the best! Hope you and the fam are well and tell everyone the Gerard’s say hi! 🙂 Hope the salad is a hit! 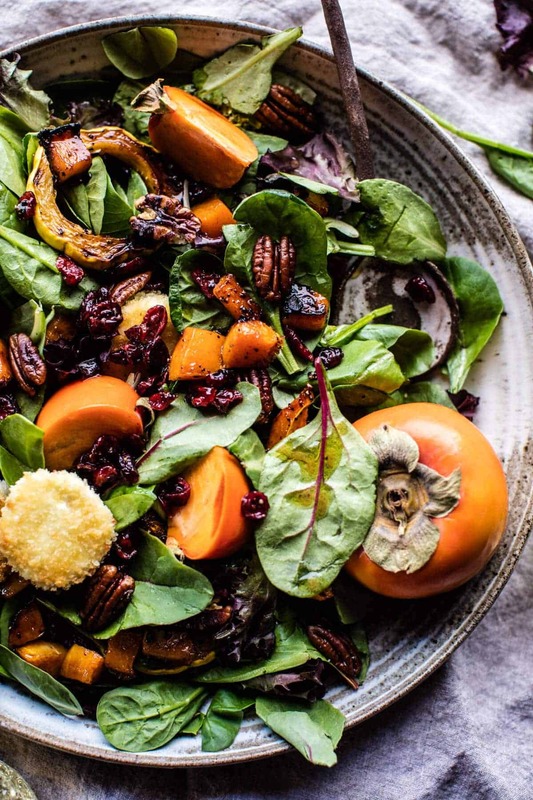 What a great looking salad, I love the combination of roasted squash and persimmons. I will make it soon, maybe for Thanksgiving. Perfect for Thanksgiving! Thanks so much Gerlinde! I am all about a great holiday salad and this is it. Gorgeous! Thank you Laura! Happy you love this one! 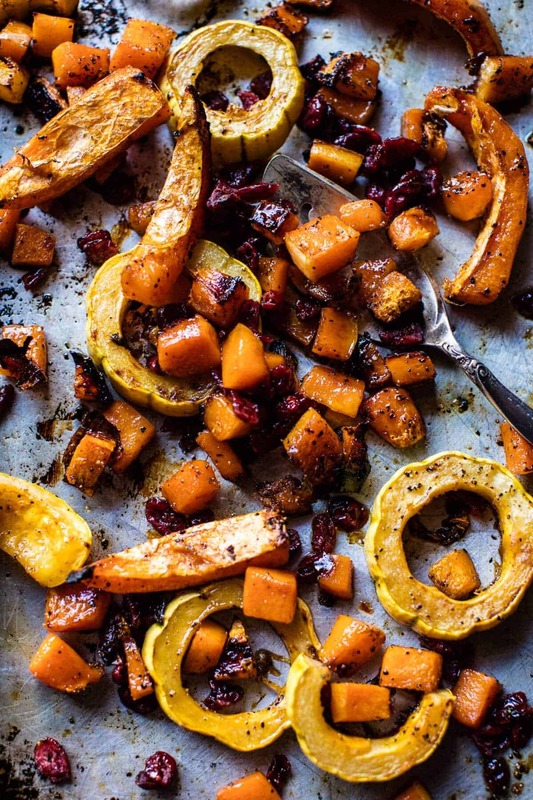 You had me at roasted butternut squash!! YUMMMM. Thanks for the inspiration! It has been a long time since I made a salad with fried goat cheese, so you suddenly made me very hungry 🙂 And what a good idea to combine it with butternut squash. I hope you love this one Sidsel! Thank you! Oh I’m so into this. I just saw persimmons at Whole Foods and was like “I need a recipe for these.” Welp, found! Perfect timing! I hope you love this salad Sarah! Thanks so much!! I need to get my hands on some persimmon, I don’t know why I’m waiting so long to take advantage of them! Yes you definitely should haha! Thanks Gina! That is one gorgeous salad and I’m loving the flavors! Agreed! We need a little green!! oh my gawd, and all the fall things! love this salad! so beautiful! What a gorgeous holiday salad Tieghan! The colors, the flavors…perfect! I would eat this first on my Thanksgiving plate! 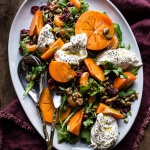 Also, so funny, I’ve been eating persimmons and roasted butternut (topped with burrata) – now I need to fry some goat cheese to throw on top! 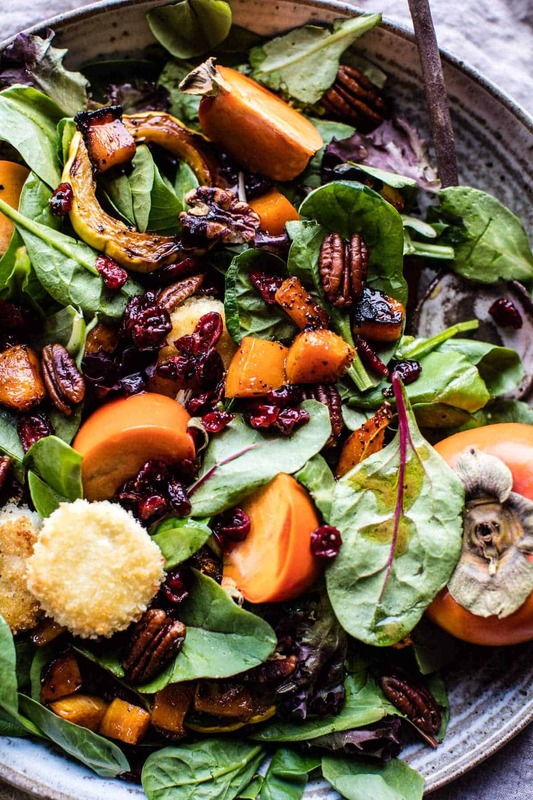 Such a gorgeous salad – hope your epic Thanksgiving is so delicious!! That sounds delish!! The goat would be amazing!! Thank you so much Sarah!! Happy thanksgiving! I just made this … so delicious ! thanks for a great recipe ! So happy you liked it, thanks Kristine!! Salads are actually one of my favorite Thanksgiving dishes! I love how the squash and persimmon just makes the green of the lettuce pop perfectly!